AmSafe Bridport Limited is displaying its Tarian® RPG Armour at the Singapore Air show from 11th – 16th February 2014. This revolutionary, lightweight and durable armour is fitted to a Singapore Technologies Kinetics’ Bronco located on ST Kinetics’ stand G01. This is the first time their latest technological advances, including a fully flexible mounting system, has been shown in Asia/Singapore and builds on the relationship established through the MOU signed on 14th September 2011. It is this most recent system which is now fitted to a variety of UK military vehicles following the company’s £10.6M contract award from the UK MOD on 21st December 2012. Tarian® RPG Armour is a highly effective solution for protection against RPGs and also the world’s lightest. Developed in close collaboration with the UK Ministry of Defence (MOD), the Tarian® system has been extensively tested – including over 750 live shots – in the UK, France and the USA. This testing has verified Tarian’s high level of performance and multi-hit capability. Tarian® was launched in 2009 and is currently in service fitted to a wide range of vehicles deployed by the British Army in Afghanistan. The core element of Tarian® RPG Armour defeat mechanism is an extremely strong textile net manufactured from high-tenacity fibres. Tarian® nets are attached to vehicles using a robust flexible mounting system to withstand harsh vehicle operating conditions with low susceptibility to damage. Compared with traditional bar armour RPG protection, Tarian® provides significantly improved protection performance and, being significantly lighter, enables vehicles to operate more efficiently. At the Singapore Air Show, AmSafe Bridport is taking the opportunity to announce the recent appointment of Matthew Chuter as Product Line Manager – Tarian®, responsible for its global business activities. Additionally, in response to the very significant international interest in Tarian®. AmSafe Bridport has expanded its UK- based sales team and its Tarian® marketing team with the establishment of a dedicated North American operation (based in Erie, Pennsylvania, USA). Tarian® has been developed as a lightweight modular system designed to replace traditional bar or slat armour at a weight saving of up to 98 per cent. Those vehicles which cannot accommodate the added weight of traditional RPG armour can now be protected with Tarian®. The Tarian® technology was originally introduced into active military service in May 2009 and has been rigorously tested – in the UK by the Defence Science and Technology Laboratory (DSTL) – an MOD agency – and in the US by its Department of Defence counterpart – DARPA. This testing has verified both a high level of performance and a multi-hit capability inherent in the Tarian® technology. On 7th February 2013, AmSafe Bridport Limited announced that it had secured a contract to supply Tarian® RPG armour systems to the UK Ministry of Defence (MoD). This contract award followed an international competition where Tarian® was one of three solutions down-selected for a programme of rigorous testing and trials, including live firing and vehicle field trials. That contract included the supply of several hundred Tarian® RPG armour system kits for a variety of vehicle types that are currently in service in Afghanistan. The contract value was £10.6M (US $17M, Singapore $22.5M) and was completed at the end of January 2014. 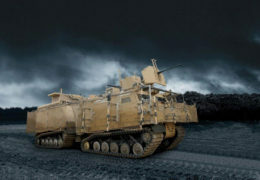 AmSafe Bridport Limited has been developing its relationships with global military vehicle manufacturers, such as ST Kinetics (Singapore) and FNSS (Turkey), with whom AmSafe Bridport has signed Memoranda of Understanding. These relationships enable the highly effective Tarian® Armour System to be co-operatively developed and offered to customers either as original equipment or as retrofit.